How can I contact ADC? Can I purchase directly from ADC? How do I obtain warranty service for my ADC product? Where are ADC products manufactured? Do you have any Material Safety Data Sheets for your products? Do you sell directly to doctors, nurses and other healthcare professionals? How can I purchase ADC products? I own a retail store, how can I become an authorized ADC dealer? What is covered under my product warranty? What is not covered? Are ADC’s products FDA approved? I notice that some websites promote that their products are FDA approved, but ADC does not. Why? Some medical devices have a 510(k) number. What is this and do ADC devices have a 510(k) number? Are ADC devices registered or licensed in other countries? Does ADC have official distributors outside of the US? Does ADC provide assistance with exports, customs, or regulatory authorities in other countries? I can’t seem to watch your videos. What’s wrong? Can I return ADC products to my local ADC dealer for repair? Can I send products manufactured by other companies to ADC for repair? How long do warranty repair services typically take? Do warranty services include recalibration? My ADC device is not broken, but I am not sure if it remains in calibration. Can I send it in for a check? I sent in an aneroid gauge that required recalibration. What information do you provide about the calibration of the gauge? Can I obtain a certificate of calibration for my ADC product? I ordered product from ADC and the packaging included a warning that indicates the package contains lithium-ion batteries. Why was this warning included? I received a shipment with products that contain lithium-ion batteries and the packaging was damaged during shipment. What should I do? The lithium-ion battery in my device has been damaged and/or I no longer need this battery and wish to dispose of it. Why does the color of the actual product look different from the color shown on the website or in the catalog? Is the fingertip pulse oximeter safe for children? After wearing my scope for awhile, the tubing became rigid. What caused this, and is there anything I can do to restore its original pliability? My Adsoft™ eartips occasionally come loose from the binaurals. Why does this happen, and what can I do to make them more secure? How do I maximize my scope's acoustic performance? Why do some scopes have a single sided chestpiece, others a two sided chestpiece, and still others detachable chestpiece fittings? What is the advantage of a two-tube stethoscope? Which is better - short or long tubes? Which ADC stethoscope should I purchase? How do I select a professional stethoscope? What makes an ADC stethoscope better than other brands? Can an internal defibrillator or pacemaker cause static or other interference with our Adscope™ 657? I am confused – the warranty in my ADSCOPE stethoscope instruction manual indicates that only the metal parts are covered. But on your website it says the entire scope is covered. Which is it? Can I convert my older, threaded Adsoft™ eartips to the new Adsoft™ Plus snap-on silicon eartips? How do I affix my new Adsoft™ Plus silicon eartips to my Adscope® stethoscope? What are the differences between the Adsoft™ and Adsoft™ Plus eartips? Sometimes I have a hard time hearing out of my ADC stethoscope. Why? Are there any standards governing performance of blood pressure instruments? How do I know if my aneroid or mercurial sphyg is out of calibration? Which is more accurate: mercurial or aneroid sphygs? The term "certified" is printed on some aneroid dials. What does this mean? The tubing on the cuff occasionally comes loose from the palm-type gauge. What can I do to make it more secure? Why is it important to have latex-free products? What's so special about the ADCUFF™? What is the clinical advantage of ADC's Multicuff kits? What about so called "adjustable gauges". How do they work? Most aneroid blood pressure instruments look alike. How can I tell the difference and why should I choose an ADC brand sphyg? How fast should I deflate my sphyg during measurement? How important is the size of the inside bore of the cartridge tube in mercurial blood pressure instruments? How accurate is my aneroid or mercurial blood pressure instrument? How can I test the accuracy of my aneroid manometer? Why do the readings on my mercury blood pressure instrument sometimes read very high? Why does the tubing and bulb on my blood pressure instrument sometimes turn white? What do I do in the event of a mercury spill? When I squeeze the bulb to inflate the blood pressure cuff, the bulb itself doesn’t compress. What is wrong? I had originally owned an ADC Sphyg with a child cuff and its time to replace it. I have been told that I now need a small adult cuff. I don’t understand. Did you change the name of the cuffs? State regulations require that we keep pediatric cuffs in our rig. Which ones do we need? Which multicuff should I purchase? Do you offer a pediatric multicuff system? I want a portable multicuff system that includes your smallest cuffs, but I don’t see one on the website. How can I get one? I am using an aneroid sphyg and the blood pressure values are too high. What is wrong? Are there any precautions when using an infant or child cuff? I've heard that mercury sphygmomanometers are restricted. Is this true? I’ve heard that there can be differences in blood pressure measurements taken depending on how a patient is positioned. How relevant is patient positioning to accurate blood pressure measurement? There seems to be a difference between older palm style gauges when compared to the newer ones. Has there been a change and are the gauge connectors cross compatible? I have an older style (804) palm gauge and need a new connector. Are replacement parts available? Why do the readings on my digital BP monitor vary? How do I know if my digital sphyg is accurate? Which is more accurate - a manual home blood pressure monitor, digital monitor with arm cuff, or wrist monitor? What does it mean when my digital home BP monitor displays the FULL message onscreen? How can I obtain the most accurate readings from my home blood pressure monitor? Does it matter which arm I use when I take my blood pressure? Why do temperatures vary between oral, rectal, or axillary measurement sites? The thermometer sheath tears when I insert the thermometer and peel away the protective top covers. What am I doing wrong? What are the advantages of fiber optic laryngoscopes over those with standard illumination? Will ADC laryngoscope blades attach to other handle brands? Can you use ADC handles with other brands of blades? Which profile is the most popular, Macintosh or Miller? Do the ADC laryngoscope blades come sterilized? How can I sterilize my ADC laryngoscope blades? Which neurological hammer should I purchase? What do the different tuning fork frequencies test? What is the purpose of the weight on the C128 and C256 tuning forks? What is the frequency in Hertz of each of the tuning forks? I am having trouble hearing anything from your tuning forks. Am I doing something wrong or is it malfunctioning? What kind of tests can be conducted with the tuning fork? Which tuning fork should I use for vibratory sensation testing? Which tuning forks should I use for Weber and Rinne tests? What is the best method to use to activate my tuning fork? How do I deactivate my tuning fork? What is the needle and brush used for in the Buck and Babinski neurological hammers? From within the United States, you can call Toll-Free, 1-800-ADC-2670 between 9:00AM and 5:30PM, Eastern Standard Time, Monday-Friday. From outside the United States call 1-631-273-9600. Our fax number is 1-631-273-9659. Or you can send emails 24/7 to info@adctoday.com. We will generally answer your email inquiry within one business day. ADC sells its products ONLY through authorized dealers. For a list of authorized dealers in your area, call 1-800-ADC-2670 or click here for additional contact information. You can return any ADC brand or ADC manufactured product directly to ADC for warranty service. Products that are still under warranty will be serviced free of charge, and those products that are no longer covered under warranty will be repaired for a nominal fee (typically the cost of labor and parts). When returning items to ADC, please package them carefully to ensure that they are not damaged in transit. Please enclose a note briefly describing the problem along with your return address, daytime phone number, and email address if you have one. If you are sending a mercurial sphygmomanometer in, please contact our customer service line at 1-800-ADC-2670 to learn more about how to ship these devices or to obtain a mercury return kit. ADC partners with the world's leading ISO 9000 subcontractors to produce components incorporating proprietary features and technologies on an exclusive basis. ADC then inspects, assembles, and packages the finished products in its Hauppauge, NY facility. Some products may have as many as 6 different countries of origin! Material Safety Data Sheets are not required for most of our products and are not available in most cases. We do offer Material Safety Data Sheets for our mercury blood pressure instruments. These are available upon request OR by clicking here. ADC is a manufacturer and distributor of professional and homecare medical products and only sells through authorized retail dealers. You can visit your local retail store for healthcare professionals or contact us at info@adctoday.com and we'll be glad to put you in touch with the authorized ADC dealer nearest you. You can contact us at info@adctoday.com or call toll-free at 1-800-ADC-2670 to let us know you're interested in becoming an authorized dealer. We'll have one of our representatives contact you about setting up an account soon after we receive your communication. Warranties vary by product. Typically, and unless stated otherwise, the entire product is covered for the duration of the warranty, including all repair parts and labor. Warranty coverage typically does not include postage to and from our service center. Warranties also do not cover incidental and consequential damages unless prohibited by state law. As mentioned in an earlier FAQ, the FDA does not endorse specific medical devices or medical device manufacturers. Companies that list their products as FDA approved are misbranding these medical devices in violation of the laws and regulations of the United States. A 510(k) number is a premarket notification number that is required for certain classes of medical devices in the US. Generally, devices that are higher risk require premarket notification to the FDA prior to bringing the devices to market. The 510(k) number is issued once a company has proven that a device is substantially equivalent in performance and safety to other devices already existing on the market. ADC manufactures and distributes a number of devices that require premarket notification, and the 510(k) numbers for these devices are available from our regulatory department. It should be noted that devices with less risk are often exempt from the premarket notification requirements. Yes! ADC maintains licensing and registration in a number of other countries, most notably Canada and the European Union. Information relating to license numbers and CE certificates may be obtained by contacting ADC’s regulatory department. Yes! Contact our customer service department for assistance with your export requirements. Our trained staff can help you obtain any information needed for foreign registrations, customs documents, or other regulatory/technical information required for the products. Certificates to Foreign Governments are also available upon request for international customers. Yes, your local ADC dealer can assist you with replacement parts or warranty service either directly or by forwarding your product to ADC for servicing on your behalf. Regrettably ADC can only repair and service products manufactured by ADC. If you need assistance identifying the manufacturer of the brand of product you own, please call our toll free number at 1-800-ADC-2670. Generally most devices can be serviced within 5 business days or less. It is recommended that you plan for a device to be out of service for two weeks as transit times to and from ADC may vary depending on your location. Yes! ADC’s service center will test devices requiring calibration using test equipment calibrated to NIST traceable standards. Where devices require recalibration, this service will be performed free of charge as part of the repair process. Calibration checks are a standard part of the ADC repair service and your device will always be tested prior to its return to you. If a product is under warranty and cannot be recalibrated due to damage, replacement parts will be provided (and tested) during the repair process. All recalibration services that are performed on gauges include a calibration sticker that will be applied to your device indicating the date that the calibration was performed and the suggested date for recalibration in the future. Yes, although due to the time and labor involved this service is not provided free of charge. A $50 fee is applicable for each device that you wish to have certified. We recommend this service only for those customers who are using their device in sensitive research where an extra assurance of accuracy may be beneficial or required. ADC can only provide credit for new, unused products and only to ADC retailers who have purchased the product directly from ADC. Please contact the ADC retailer where you purchased the product for information on their return policy. It should be noted that restocking fees may apply for items returned for credit. ADC dealers that wish to return a purchase for credit should contact our customer service department and obtain a return authorization. Products with lithium-ion batteries have certain shipping restrictions, including restrictions on the shipment of these batteries via aircraft. The warning on the package is designed for freight forwarders so they are aware that the items they are handling contain these batteries. If the packaging has been compromised and you suspect the lithium-ion battery in your device has been damaged, do not attempt to charge the battery or use the product. Contact our customer service department at 1-800-ADC-2670 for assistance with your damaged shipment. Note that you should not attempt to re-ship damaged devices that contain lithium-ion batteries; see the sections below for additional details on how to handle these batteries. Damaged or waste lithium-ion batteries should not be disposed of along with regular waste. These batteries can be recycled and you should locate the nearest recycling center to properly dispose of the batteries. To locate a recycling center near you, go to www.call2recycle.org and use the locator. Care should be taken when transporting multiple batteries for recycling. Battery terminals should not be in contact with one another during transport or storage, and where applicable you may place electrical tape over the battery contacts to help prevent short circuiting. Never dispose of lithium-ion batteries in fire or allow them to be exposed to excessive heat or flames. Over the years, we’ve greatly expanded the number of color options we sell. While this means more choices for our customers, it’s also presented some challenges when the color that arrives isn’t quite what a customer expected. In product descriptions, we represent colors with both names and images. We try to use straightforward names for our colors, and for many this works well (e.g., black, red, navy.) In other cases, especially within color families, the names can be more subjective (e.g., turquoise vs. teal vs. Caribbean). On a few occasions, we’ve missed the mark and have changed the name or even tweaked a product’s actual color. There have also been cases where the color of the components provided by our subcontractors drift a little over time as new lots are produced. In most cases though, a color discrepancy arises because a photograph, either in print or online, appears different across different media or to the individual who’s looking at it. The colors within a photograph can vary from the actual product as it moves from three dimensions to two. The color on printed pieces produced from that photograph (whether official ADC materials or dealer catalogs) may shift a little further based on variables like the type of paper. Product displayed on various electronic screens – phones, tablets and computer monitors – will all display color differently, sometimes dramatically so depending on the graphics card, drivers, and the type of backlighting and room lighting. And finally, no two people actually perceive color in exactly the same way and may have different ideas of what a particular color “should” look like. So what one person sees as a light turquoise, someone else might see as a powder blue. With all that said, we work very hard to ensure our products are displayed as accurately as possible so the color you see in the catalog or on the screen is as close as possible to the color you receive. The Diagnostix 2100 and Advantage 2200 fingertip pulse oximeters can be used on children at least one year old or weighing at least 28 lbs (13kg). The Adimals 2150 fingertip pulse oximeter is designed specifically for children with a finger thickness of 0.2” to 0.63” (5.0mm to 16.0mm). Under certain conditions, the PVC tubing used in our ADSCOPES when exposed to atmospheric ozone, combined with skin oils can become rigid. If you wear your scope around the neck, try not to let it come in contact with the skin. In addition, periodic treatment with a vinyl protector (such as Armor All) once a month may delay the process. Should the tubing in your ADSCOPE become rigid, return to ADC for complimentary warranty service. Older style Adsoft™ PVC eartips (included on all Adscope® stethoscopes manufactured prior to 2014) are equipped with a threaded insert. If your stethoscope is equipped with threaded eartips, periodically tighten the eartips to ensure security. You may apply Teflon™ tape, or clear nail polish to the binaural thread to improve security without compromising scope performance or jeopardizing warranty coverage. Do not apply the adhesive to the eartips. Before using stethoscope, make sure glue has thoroughly dried. Should you have further issues with your eartips, or if you would prefer to receive our new silicon Adsoft™ Plus eartips with an adapter for more security, contact ADC for a complimentary replacement pair at info@adctoday.com or call toll-free at 1-800-ADC-2670. To maximize performance of your ADC scope, you want to optimize the seal from the scope's chestpiece to your ears. Any leakage or obstruction will impede performance. First, align the binaurals properly so that the eartips point towards the bridge of your nose. On PROSCOPE series scopes and the ADSCOPE 641, you will need to adjust the binaurals to align the eartips correctly. On ADSCOPE series scopes, the binaurals are pre-angled 15° forward for a snug fit. But, you must make sure to position them correctly - eartips FORWARD. Next, adjust the binaural tension. Too loose and acoustic transmission will suffer. Too tight and the scope will not be comfortable. To reduce the tension, grip the binaurals firmly using both hands with fingers at the center of the "Y" in the tubing, thumbs at each side with the tubing branches out. Flex binaurals gradually until the desired tension is obtained. To increase the tension, grip the binaurals in the hand and squeeze the binaural tubes together gradually. Please note that excessive adjustment of the spring tension could weaken the spring. Select the eartips that are most comfortable and best seal the aural canal. ADC scopes come with at least two pairs of eartips; many are equipped with three pairs. Finally, make sure that you maintain your scope in good working condition. Obstructions from dust or dirt in the binaurals will impede performance, while tubing cracks will permit acoustic leakage. Generally speaking, to attenuate certain frequencies. The flat side is equipped with a membrane that is generally referred to as the diaphragm side. The conical or bell shaped side is called the bell. Body sounds generally fall within a frequency range of 50 to 2000 Hz. The diaphragm side is designed to attenuate the lower frequency and accentuate higher frequencies within this range - from 500 to 1000 Hz. The bell side is designed for lower frequencies - from 50 to 500 Hz. Most diaphragm only scopes (ADC 660, 662 and 665 series) are designed for general assessment or blood pressure measurement. Combination scopes (those equipped with both a diaphragm and bell) are designed to provide a broader frequency response. In a typical combination scope, only one side of the chestpiece is "active" at a time. Rotating the chestpiece around its valve stem selects one side and "deactivates" the other. It should be noted that on better quality models there is little or no acoustic leakage from the "deactivated" side. Our top of the line ADSCOPES with AFD technology allow adjustment of the frequency by altering pressure to the chestpiece. Light pressure accentuates lower frequencies, while firm pressure accentuates higher frequencies simulating the diaphragm and bell sides of a two sided chestpiece. ADC offers AFD technology in ½ dozen models ADC produces over a dozen different models of combination scopes with an MSRP from under $2 to nearly $300. Two-tube stethoscopes, such as the ADSCOPE 600, 601, 606 and 641 (the 600, 601 and 606) feature our two-tube in one design, while the 641 actually has two separate tubes) provide better stereo separation allowing you to hear the subtle characteristics of heart sounds and murmurs more distinctly. The heavier tubing also filters out the distracting noise typical of a busy medical environment. Laboratory tests have demonstrated that shorter tubing provides a better acoustic response. In reality, most people do not have the hearing acuity to detect any performance impact from changes in tubing length unless there is a dramatic change in that length. In fact, the acoustic transmission of lower frequencies, with their longer wavelength, benefit slightly from increases in tubing length. Longer tubing tends to make the scope more convenient to use, but also adds a bit to its weight. Bottom line - tubing length is generally a matter of personal preference. ADC makes dozens of stethoscopes - from institutional models with a MSRP of about $2.00 to a professional electronic model costing nearly $300. The model you should choose depends on the application and your budget. First and foremost, choose the scope that works best for YOU. Check the fit and comfort; you could be wearing your scope for extended periods of time. Eartips are critical as they are the interface between you and the instrument. Make sure they’re both comfortable and provide a proper seal to optimize sound transmission. ADSOFT eartips, found exclusively in our ADSCOPES provide the ultimate in wearing comfort and acoustic seal. Next, choose a scope that has the features you need within your budget. ADSCOPES are available with MSRP’s from under $20 to about $300 so there’s sure to be a model that’s right for you. Finally, make sure your scope is covered by a comprehensive warranty program and backed by a company with a reputation for customer service. Acoustic ADSCOPES are covered from 5 years to life, depending upon the model. With over 30 industry awards – most of them for service - ADC is one of the most honored names in core diagnostic instruments. It’s a name you can TRUST. If you need versatility, you may want to select a convertible model - a scope with interchangeable chestpiece fittings such as our ADSCOPE 641 (Sprague series), or ADSCOPE 601 (Convertible Cardiology). Stainless steel is generally the preferred metal; its extra mass tends to help eliminate extraneous acoustic artifacts. So, for best acoustic performance and maximum durability, choose one of our all stainless models - 600, 601, 603, 604, or 605 series. However, there is a weight/performance trade-off and you might prefer a lighter weight model such as the Ultra lightweight Cardiology 606 or the Clinician-lite 609 series. These scopes weigh as little as ½ the weight of their stainless counterparts. Better models tend to have a double tube configuration which provides enhanced stereo separation. Our ADSCOPE 641 has two tubes. Our ADSCOPE Cardiology models - the 600, 601 and 606 series have a single tube with bi-lumen (two tubes in one) design. If you prefer a single sided, sculpted chestpiece choose from any one of our Platinum series ADSCOPEs - the 600, 612, 614, 615 series. These models feature a single sided chestpiece with our Adjustable Frequency Diaphragm(AFD)/Technology. AFD allows you to choose bell or diaphragm performance from a diaphragm only scope. If you prefer AFD Technology in a traditional 2 sided chestpiece, look no further than our Convertible Cardiology 601. For blood pressure measurement, the ADSCOPE 609 series provides many of the design features of our more expensive models in a lightweight, affordable stethoscope. Institutional buyers generally choose from our PROSCOPE series (660, 662, 665, and 670 series) which provide excellent performance at market sensitive pricing. Because stethoscope selection is really a matter of personal choice, we recommend that you try a few models to determine the one that works best for you. Five factors – Performance, Quality, Durability, Warranty, and Value. Performance: According to independent lab tests, ADC PROSCOPE and ADSCOPE stethoscopes perform as well, or better than comparable competitive models. Depending on model, they may include AFD Technology, PVC diaphragm rims and bells, ADSOFT eartips, bi-lumen design internal spring binaurals and convertible chestpieces for unmatched versatility. Quality: ADC stethoscopes are made from the finest materials - brass, aluminum, stainless steel and PVC, all manufactured to the highest tolerances. Final inspection, assembly and packaging are then performed in ADC's Hauppauge facility to ensure strict compliance to ADC's uncompromising standards. Durability: ADSCOPES are made from the finest materials and designed to withstand the toughest use. Warranty: Depending on model, ADC scopes are warranted from 1 year to life. Value: Despite providing superior materials and construction, performance and warranty coverage, ADC scopes are generally priced 20% to 40% less than some models and priced only a little more than those so called "imports". A pacemaker will not cause interference. Defibrillators may cause some interference, but only at those times that the defibrillator is actively firing. For many years our official warranty statement excluded tubing and other consumable parts like eartips, diaphragms and rims. In reality, we always provided free repair/replacement of any parts so we decided to formally re-write our warranty policy to be comprehensive. In fact, if you need eartips or other consumables, simply contact our customer service department and we will be happy to send them to you with our compliments. If, while under warranty, your scope needs more extensive repairs in our service department, send it back to us for complimentary refurbishment during service. AFD stands for Adjustable Frequency Diaphragm technology. Stethoscope models with AFD technology feature a single sided chestpiece that allows adjustment of the frequency by altering pressure to the chestpiece. Light pressure accentuates lower frequencies, while firm pressure accentuates higher frequencies, simulating the diaphragm and bell sides of a two sided chestpiece. Yes! Conversion kits are available that will allow you to affix Adsoft™ Plus eartip adapters on your existing Adscope® stethoscope. Contact our customer service department at 1-800-ADC-2670 for more information about obtaining upgraded eartips for your Adscope® stethoscope. This will depend on the age of your Adscope® stethoscope. 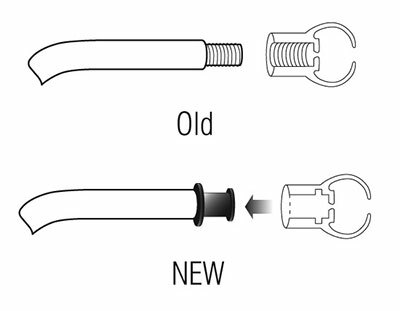 If your Adscope® was manufactured prior to 2014 and has threaded aural tubes, you will need to affix a special adapter to use the new Adsoft™ Plus fitted silicon eartips. To begin, ensure that the old eartips are removed from each aural tube. You will need to apply a single drop of glue on the threads of the binaural and thread the earpiece adapter (supplied with your Adsoft™ Plus eartips) until it is hand tight. (We recommend Loctite®, Krazy® Glue, or a similar adhesive.) Once the adapter is in place, slide your new Adsoft™ Plus eartip over the adapter until it locks into place. Repeat this process for your second binaural. If your Adscope® stethoscope is already equipped with eartip adapters rather than threading on the binaural, then all you need to do is slide your new Adsoft™ Plus eartip over the adapter as described above, locking it into place. Older style Adsoft™ eartips are made with PVC and feature integrated threading that will allow them to thread onto Adscope® stethoscopes manufactured before 2014. While comfortable and secure, these eartips can loosen over time and require that the end user perform minimal maintenance in the form of tightening the eartips on their threading. New Adsoft™ Plus eartips are made of silicon and feature an adapter that the eartip snaps onto. Supplied with newer Adscope® stethoscopes manufactured in 2014 or later, these eartips cannot loosen over time as their adapters are permanently affixed to the ends of the aural tubes. There are a number of reasons that could happen. One is called the binaural effect. In the binaural effect sound presented to two ears is judged to be louder than the same sound at the same loudness presented to only one. To illustrate this phenomenon, try this experiment. Listen to music though earbuds and remove one from the ear without touching the volume. The perceived volume will drop dramatically. What does that have to do with your stethoscope? Well if the headset isn't properly aligned, the spring tension is too loose, or the eartips don't make a good seal, the sound transmitted to one ear may be impeded. You will perceive this as a dramatic drop in volume, or, at the very least dramatically reduced sound on the “disconnected” side. This can also happen if you hold your head in a certain position during the auscultatory exam. Take these steps to ensure a proper aural fit and maximum acoustic performance. Headset Orientation: Make sure the eartips point forward TOWARDS the bridge of your nose. This is the number one cause of diminished performance in a stethoscope. Eartube Alignment: Make sure each eartip sits snugly, firmly, but comfortably in the ears. Adjust as needed. Eartip Fit: Large and small Adsoft are provided. (small are on the scope). Some models include a second pair of small as well. Pick the size that provides a comfortable fit and good acoustic seal. As to head position, most professionals find that for best headset alignment and acoustic seal, the head should be tilted down slightly. All medical device manufacturers and most medical devices are regulated by the Food and Drug Administration (FDA). The FDA has accepted the sphygmomanometer standards established by the American National Standards Institute. The ANSI/AAMI/ISO 81060 series of standards set performance requirements for non-automated (aneroid & mercurial) sphygmomanometers as well as automated (electronic) sphygmomanometers. You may obtain copies of these standards by contacting ANSI or visiting their website. Aneroid sphygs utilize mechanical gears and a mechanical linkage which can wear out or be knocked out of calibration. ADC aneroids are designed to provide a visual indication of accuracy. Our aneroid will require re-calibration if the indicator needle is outside the oval at the bottom of the dial. Unfortunately, when the needle is inside the oval, you can't be absolutely sure that the gauge is in calibration, unless it is a brand new unit from a reputable manufacturer (that's because gauges can be tampered with - some more easily than others). As such, it's a good idea to periodically test the gauge against a unit of known accuracy, or return the unit to ADC for complimentary testing. How often you should perform these accuracy tests depends on many factors, but in general, once a year should be sufficient. Mercurial sphygs utilize gravity and contain no moving parts other than the mercury itself. As a result, there is nothing to wear out. A properly designed mercury manometer will be in calibration as long as the meniscus (top of the mercury column) rests within 3mmHg of the zero point with no pressure applied (inflation system should be detached since it might contain residual air). Mercury units do require some maintenance to remain in tip-top shape. Since mercury will evaporate, a small amount might need to be added to the instrument from time to time. Additionally, mercury will oxidize, leaving a residual gray deposit on the inside of the cartridge tube. This should be swabbed away using alcohol applied to a pipe cleaner. Once a year or so, the damping filters and diaphragm located in the top cap above the cartridge tube should be replaced. ADC provides self maintenance manuals with every mercury unit purchased. Of course, we will perform complimentary maintenance on any ADC mercurial manometer returned to our repair facility. By law, both instruments must initially be within 3mmHg of a reference standard. However, because aneroid gauges rely on gears and mechanical linkages, mercury instruments will likely REMAIN accurate for a longer period of time. However, there is a trade-off; mercury instruments are generally not as portable and necessitate the use of 99.9999% pure elemental mercury, which is being banned by more and more municipalities and states. It depends on the manufacturer. In our case, it indicates that the gauge has been produced and tested to meet the U.S. Accuracy Standard of +/- 3 mmHg. This certification is our pledge and your guarantee for an accurate reading. ADC's 804 series gauge uses a quick release luer slip connector designed to allow rapid selection of the appropriate cuff. To attach, push and twist the tube connector into the gauge air inlet. When properly attached, less than 1/16" of the connector should show and the tubing should remain secure even under the harshest conditions. Do not force as it may be difficult to separate the connector from the port. Latex sensitivity is a serious problem for both patients and healthcare workers. It is estimated that 7% of the general population and up to 17% of healthcare workers are latex sensitive, with reactions ranging from mild skin irritation to anaphylactic shock. ALL ADC products are 100% LATEX-FREE. In the past, there were just three components on a sphygmomanometer that were traditionally made from latex - the inflation bladder (contained inside the cuff), the inflation bulb and the coiled tubing (used on some models). All other components of a blood pressure instrument were always latex-free. ADC listened to the emerging needs of the market and has produced a comprehensive line of latex-free sphygmomanometers and accessories, eliminating latex entirely from our sphygmomanometer line. The bladder, bulb and coiled tubing are made from PVC, TPE, TPU, and other synthetic materials that share the performance characteristics of latex without the risk to latex sensitive practitioners or patients. We produce over 200 different latex-free blood pressure instruments and replacement parts. Very. Incorrect sizing could lead to measurement error when the mis-sized cuff fails to properly compress the brachial artery. Cuff size is determined by the size of the bladder, also known as the inflation bag. According to AHA and ANSI standards, the bladder should measure at least 80% of the intended limb circumference in length. The bladder width should measure at least 40% of its length. The cuff itself should then be designed AND marked to encourage or even restrict use to the limb circumference established by its bladder. ADC manufacturers 6 standard series cuff sizes designed to accommodate limbs from about 3.5 in (9 cm) to 25.9 in (66 cm), all with overlapping ranges. Our Size Guide™ Marking System helps prevent mis-cuffing. Most manufacturers utilize a generic size naming system - such as newborn, adult, child, etc. Since there are no standards to define the specific limb range for a particular generic size, some manufacturers, including ADC, also indicate the specific limb range in centimeters right on the cuff. ADC also produces single patient use (spu) cuffs in a neonatal series designed to accommodate limbs from 1.18 in to 15.75 in (3cm to 40cm). ADCUFF™ is the trademarked name for ADC's line of professional blood pressure cuffs, inflation bladders, and SPU (single patient use) cuffs. The ADCUFF™ was carefully designed to balance the requirements of ANSI/AAMI/ISO 81060 and AHA recommendations while combining the real-world needs of our customers. Bladders are designed to encircle a minimum of 80% of the maximum limb circumference for which they were intended in order to ensure proper compression of the brachial (or femoral) artery. Bladder width is no less than 40% of bladder length. Bladders are made from latex-free PVC. Each is marked with our part number and its size name to facilitate identification and re-order. Our proprietary convertible bladder can be used with both single and double tube systems. Fabricated from 210 denier nylon in a large array of colors - durable but comfortable. Sewn with 11 threads per inch. Hook and loop adhesive designed to withstand a minimum of 30,000 open close cycles (many low priced imports use inferior adhesive that wears quickly). Size icon system simplifies rapid visual identification of size. Size Guide System™ marking system. Indicates applicable limb range and warns if larger or smaller cuff is needed. "Property of" tag facilitates marking for better stock control. Incorrect cuff sizing can greatly affect the accuracy of blood pressure measurement. Too small a cuff will cause an overestimation of blood pressure, and too large a cuff an underestimation. Multicuff kits are blood pressure instruments that contain more than one cuff size. ADC's various multicuff kits contain from 3 to 5 cuffs (with limb ranges from 3.5cm to 66cm) packaged in a variety of carry cases and stands that allow rapid selection of the most appropriate cuff. A few manufacturers produce so called "adjustable" gauges. These gauges permit the indicator needle to be re-set to the zero point using a conventional jeweler's screwdriver inserted into the air inlet at the base of the gauge. ANSI/AAMI/ISO 81060 prohibits the manufacture of any instrument with an adjustable dial, except by use of a specialized tool. We hardly think a jeweler's screwdriver available from virtually any hardware store qualifies as a "specialized" tool. Whether or not they are legal, we feel adjustable gauges can be dangerous! Although re-setting of the indicator needle to zero will occasionally re-calibrate a gauge, it often will not. The only way to ensure proper calibration, once adjusted, is to bench test the instrument at a variety of points on the dial against a unit of known accuracy. There is a strong tendency to skip this CRITICAL step when gauges are adjusted in the field since it is time consuming and inconvenient (not to mention tough to find a unit of known accuracy in the field). Since ADC provides free recalibration for a minimum of 5 years to as long as a lifetime, (depending on model) we suggest you let us perform this complimentary service. It is often difficult to tell the difference between competing brands of blood pressure instruments. With retail prices from as little as $10 to nearly $250 for a basic pocket aneroid, and appearances so similar, it can be tempting to select the least expensive brands. Today, most blood pressure instruments are completely manufactured in China or Indonesia by firms with no formal affiliation with their U.S. distributors. In fact, many U.S. importers change suppliers every six months in response to lower prices from competing foreign manufacturers. That results in products of questionable quality and virtually no consistency. Only a handful of manufacturers still produce their products in the U.S.A. Components for ADC's blood pressure instruments are produced exclusively for ADC by some of the world's most experienced ISO 9000 subcontractors under long term contract. In addition, ADC employs a rigorous QC process using proprietary test equipment, prior to final assembly in the U.S.A., to ensure strict compliance to ANSI/AAMI/ISO 81060 standards OR better. ADC produces pocket aneroids with an MSRP from $20 to $60, palm and multicuff aneroids from $90 to $200, clock aneroids from $100 to $200, and mercury sphygs from $70 to $200. Each and every one is subjected to dozens of inspections prior to final assembly in the U.S.A. A sphygmomanometer is both a vital instrument for the measurement of a critical vital sign and a long term investment. Choose the model that makes the most sense for your requirements and budget as much as you can afford. Then select the ADC model that best fits your needs. The AHA recommends a deflation rate of 2 - 3mmHg per second. During routine measurement, the system is typically inflated to about 180mmHg and deflated to about 60mmHg. That’s a range of about 120mmHg (the actual range is determined by the patient's expected blood pressure). At a deflation rate of 2-3mmHg/sec, it should take 40 to 60 seconds to deflate the cuff correctly. Excessive deflation rates are one of the most common causes of measurement error - often distorting readings by 10mmHg to as much as 20mmHg. When the deflation rate is too quick, the observer's reaction time - much slower than the rapid deflation rate - may result in gross underestimation of blood pressure. On the other hand, because of a phenomenon known as mercury lag, excessive deflation COULD result in an overestimation of blood pressure when measured on a mercurial sphyg. It is critical. When the inside bore is too narrow two problems can result; mercury lag and mercury separation. Mercury lag is the phenomenon that occurs when the air deflates from the cuff faster than the mercury column can respond. When the forces of friction (of the mercury against the inner walls of the cartridge tube) that prevent the mercury from dropping exceed the gravitational forces, this causes the mercury to drop and results in mercury lag. That same friction can actually cause the column of liquid mercury to split - forcing an air pocket that will distort readings. This is known as mercury separation. If new, the unit must be within 3mmHg when tested against a reference instrument in order to meet ANSI/AAMI/ISO 81060 standards. ADC's PROSPHYG series instruments will always meet or exceed these standards. ADC's DIAGNOSTIX series manometers exceed these standards by as much as 66%. ADC DIAGNOSTIX brand mercury manometers are guaranteed to be within 1mmHg over their full range, while the DIAGNOSTIX brand aneroid manometers are guaranteed within 2mmHg when NEW. Although most low cost imports will meet the +/-3mmHg standards most of the time, the difference between ADC brand instruments and those low cost models is often how well they will hold up under real world use. ADC manometers are designed to withstand the rigors of YOUR job. Superior materials, old world craftsmanship, the pre-aging of our aneroid movements, and use of mercury cartridge tubes with 25% larger 5mm inside bores ensure that your instrument will provide dependable service day in and day out. Simply put, they will generally stay accurate for a longer period of time! Guaranteed. The only way to be 100% sure is to connect the manometer in series to an instrument of known accuracy and test during deflation at a variety of pressures (i.e. 300, 260, 180, 120, 60, etc.) When testing your sphygmomanometer, it is important that you check the accuracy in accordance with national or international standards that may be applicable to your device. For devices manufactured and sold within the US, the European Union and other international destinations, the ANSI/AAMI/ISO 81060 standard entitled Non-invasive sphygmomanometers — Part 1: Requirements and test methods for non-automated measurement type is applicable. Click here to link to the section within our site that describes testing techniques in greater detail. Although properly designed mercurial instruments are required to provide a full pressure drop (300 mmHg to 20 mmHg with no back pressure) in 3 seconds, older instruments tend to slow down due to build up of dust or other obstructions within the system. This slow down will produce a lag - the air will release from the cuff FASTER than the mercury can drop in the column. In addition, some manufacturers whose cartridge tubes have a narrow inside bore (generally less than the mandated 3.9 mm dimension) will always suffer from some lag. This lag will generally have no impact on measurements obtained at the recommended deflation rate of 2-3mmHg/second. However, when the deflation rate is excessive, the lag can have a dramatic impact on accuracy resulting in an overestimation of pressure. This condition will generally only occur on older latex style blood pressure devices. The phenomenon, known as frosting, is a chemical reaction caused by the exposure of latex to the ozone. Fluorescent lighting can exacerbate the problem. When properly cured during the manufacturing process latex should not frost. However, it can be difficult to determine optimal curing times which are dependent on ambient temperature, humidity, and the water content of the liquid latex. Although unsightly, frosting will not impact on the performance or durability of the latex components. Our current line of latex-free blood pressure cuffs will not frost. Although unlikely to occur with an ADC DIAGNOSTIX mercury sphyg, it can happen. ADC mercury sphygs hold just 2 oz of 99.9999% pure elemental mercury and can easily be contained with a mercury spill kit available through ADC or most laboratory and safety supply dealers. A mercury spill kit should be kept on the premises WHEREVER mercury instruments are used. Never use vacuums which may disperse mercury vapor. Always wear gloves and dispose of contained mercury in accordance with local regulations. If the air valve appears to be free of obstructions and you have not used your blood pressure cuff for some time, it is likely that the ‘slit stopper’ has become bound. In order to clear this problem, ensure that the air valve is properly attached to the bulb and valve assembly. (Note: It is recommended that your bulb and valve not be connected to the rest of your blood pressure device while correcting this problem.) Take the bulb and valve assembly in both hands and (with the valve CLOSED) quickly apply swift and rapid pressure to the bulb. This will force air into the valve at high pressure and cause the slit stopper to ‘pop’ open again. Once this type of jam has been cleared, it is unlikely that it will occur again unless your blood pressure device is left unused for an extended period of time. Yes. But ONLY the names. In August 2011, we re-engineered our ADCUFFs – the worlds most feature rich, traditionally bladdered cuffs. The most noticeable change was the elimination of Latex from all models (we had previously offered our ADCUFFs in both latex or latex-free options). Another change was to follow the cuff naming nomenclature employed in the acute care (hospital) sector to ensure greater naming consistency. The applicable limb ranges weren’t changed – only SOME of the names we used to describe them were changed. Below is the conversion chart. Depends on your needs. If you’re required to keep a full assortment of what are traditionally referred to as pediatric cuffs, you’ll probably want our 4 cuff system. That includes child and small adult for pediatric and smaller adult patients, and adult and large adult for larger patients. In the 4 cuff system you’ll be able to measure bp on patients with limbs from 13-50cm. Some prefer the larger 5 cuff system which includes the thigh cuff and increases the range up to 66cm. Yes, our 705PMK-??? It includes the infant, child and small adult cuffs accommodating limbs from 9-27cm. You can always purchase the components separately and build the unit yourself. Our 8814 multicuff carry case allows you to customize the pocket names yourself and comes with a full set of name tags (and blanks) you can use. There are a number of things that could be causing you to get higher values. It is possible the blood pressure of the person being measured, is, in fact, higher than believed. Blood pressure is a very dynamic vital sign and responds quickly to both physiological and psychological stimuli. Changes of 40mmHg or more on systolic values are quite common. Make sure the patient has rested for at least 2-3 minutes before taking their BP. Second, make sure you are using an appropriately sized cuff. If the cuff is too small for the patient, you could get elevated readings – in some cases significantly elevated readings. Third, make sure the manometer is accurate. If the needle rests outside the oval with the unit fully deflated, it is most definitely in need of calibration. However, even if the needle is inside the oval, it is possible for the unit to be out of calibration. Follow this link for the procedures on checking calibration. Finally, make sure you are following proper measurement technique. In manual measurement, technique is as important, if not more important than the instrument itself. Yes, these smaller cuffs are easily over-inflated. With smaller cuffs the cuff can inflate to over 300mmHg with just one or two full compressions of the bulb. To prevent discomfort or even injury to the patient and damage to the instrument, bulb should only be partially squeezed, so that each compression inflates the cuff in 40mmHg to 60mmHg increments until inflated to the desired pressure. It is very important. In general, a patient should be seated comfortably with their back and arm supported. Patients should sit with their feet flat on the floor and their legs uncrossed. When patients are supine, blood pressure measurements can vary 5-8 mmHg and this variation can increase if the arm is not supported to ensure that the cuff is at heart level. Similar variations can occur if the patient’s back or arm is unsupported, or if they are not seated correctly. Palm gauges are often subjected to some of the harshest treatment as they are designed to be transported and may be used outdoors or in rough environments. In order to increase the durability of these gauges, we have redesigned the connector with a larger barb and have altered the connector port on the palm gauge to accommodate this new connector. The larger connector ensures a firm connection, reduces the likelihood of the gauge being damaged if it is dropped or subjected to shock/vibration, and is a unique shape that is not cross-compatible with other medical equipment. The newer connector is NOT compatible with older palm series gauges. All palm style gauges manufactured and shipped after November 2015 will have the updated, more robust connector. We have updated the part numbers for these connectors as well as the markings on the gauge itself to allow for easy identification. For the part numbers for both the older and newer style connectors and gauges contact our Customer Service department at 1-800-ADC-2670. Yes, we will still honor the warranty on our older 804 palm gauges and have replacement parts available for your gauge. Contact our Customer Service line toll free at 1-800-ADC-2670 and we will be happy to assist you with your gauge. A variety of reasons. First of all, blood pressure itself is a dynamic rather than static vital sign. Both systolic and diastolic pressures can vary from 10mmHg to 20mmHg or more throughout the course of the day. In some people, a lot more than that. BP is generally lower in the morning and increases throughout the day. Eating, drinking, smoking, exercise and even talking all influence blood pressure. Instrument repeatability will also result in measurement variance. As an example, if the instrument has a stated tolerance of 3% and you measured your blood pressure at the morning when it was 120/70 and the evening when it was 130/80, the instrument might read 115/68 for the morning read, and 135/83 for the evening read. The initial impression is that the pressure varied by nearly 20mmHg when in fact, part of the variance was due to normal fluctuations in BP, and in part was due the tolerances of the instrument. For best results, you should measure your blood pressure at the same time each day, preferably first thing every morning. If time permits, take three readings, each 1-2 minutes apart. If any one reading looks out of line, discard it. Otherwise average the results and record the average of the three (or two if one was discarded). Doing this will smooth out the readings and produce more consistent and meaningful results. Our 6016, 6022 and 6023 monitors feature an average mode setting that will automatically display the average of three successive readings. ADC digital sphygs have a pressure sensor self test that is activated each time you power on the instrument. If the microprocessor detects anything wrong with either the pressure sensor or the chip that analyzes the readings, an error message will be displayed BEFORE measurement. If the unit beeps and displays 0, you can be confident in the instrument's accuracy. Tough question! When measured by a trained professional, following AHA recommendations for blood pressure measurement, a manual instrument will produce very accurate results. Today, home digital BP monitors are VERY accurate, but they do have limitations. Because the algorithms used to calculate blood pressure are based on a limited number of clinical observations, there are people for whom digital units simply will not work. Severely obese patients, those with advanced arthrosclerosis, severe diabetics, or those with a difficult to detect pulse are not good candidates for digital monitors. Wrist models, while the MOST convenient to use, and extremely portable, are often held either above or below heart level resulting in readings of questionable accuracy. All things considered, we recommend an arm or wrist based automatic blood pressure instrument. Depending on the model you have purchased, your home BP monitor will allow you to store a set number of readings. For our single-user models including the 6021 series, once you have reached the maximum number of readings that can be stored on your monitor, a ‘FULL’ message will display onscreen to indicate that the monitor’s memory is full. When this happens, taking additional readings will begin to overwrite older readings stored in memory. Refer to the instructions provided with your monitor for information on how you may clear your monitor’s memory or delete readings to free up space for new readings to eliminate this message. In order to obtain comparable readings, you should take your blood pressure at the same time each day. We recommend that you take readings when first rising in the morning, unless otherwise recommended by your physician. Arm positioning is very important; your blood pressure cuff should be at heart level, and you should support your arm on an armrest that will hold the cuff in position. When using a wrist model, care should be taken to place your wrist on an armrest or other support at heart level. You should not take measurements immediately after exercise, after consuming food/drink, or after consuming alcohol or nicotine. These factors can affect blood pressure measurements and lead to inaccurate readings. You should not talk while taking your blood pressure, as this can create sound artifacts that may impact your reading. Even just the effort of speaking will elevate blood pressure. It is recommended that you take your blood pressure on your left arm where possible. Measurements on your right arm and your left arm may not necessarily always correspond with one another and comparing readings from different arms is not recommended. Always take your blood pressure on the same arm when possible. You should sit with your back and arm supported in a comfortable position and with your legs uncrossed when taking your blood pressure. Note that lying down while taking your blood pressure can greatly impact the measurement results and it is recommended that you remain sitting upright where possible for all measurements. Where possible take multiple readings and average them. If you have an Advantage monitor with MAM technology, we recommend using the multiple reading mode. Allow one minute of rest between measurements. Yes. In general you should take your blood pressure on your left arm. If you are unable to take your blood pressure on your left arm, you may take it on your right arm instead but you should be aware that there may be differences between your right and left arms. In some patients the differences can be as much as 10 mmHg or more. It is not recommended that you compare readings between both arms if you have taken multiple readings on both, as the results may vary due to the differences between the two arms. White-coat hypertension is a phenomenon where patients tend to have higher blood pressure in the presence of health care workers and particularly physicians. In some patients it may be necessary to measure blood pressure at home to determine whether or not there is true hypertension or if the presence of health care workers is affecting the readings being recorded. It is important to note that there are a variety of other reasons for home blood pressure measurement and being asked to record your readings at home may be an important part of your treatment. Core body temperature most closely approximates the temperature obtained through rectal measurement. Oral temperatures will generally run 1 degree lower than rectal temperatures. Axillary (under the arm) temperatures will generally run 1 degree below oral (2 below rectal). Remember, 98.6 is an average of the patient population. Your average body temperature might vary by up to 2 degrees from that. And while not as volatile as blood pressure, your temperature will vary throughout the day. It is important to fully insert the thermometer into the sheath such that the thermometer’s probe TIP is within roughly 1mm of the sheath end. If too large a gap is left the sheath will fold over the tip which may result in puncture. Make sure the top cover is removed first, then the bottom cover. On flexible tip thermometers it is helpful to hold the thermometer a bit closer to the probe end to minimize flex when peeling off the top and bottom paper covers. Click on the attached link to view a video demonstrating the proper technique. There are two advantages; performance and safety. Fiber optic laryngoscopes provide a brighter, whiter light permitting better view and observation during intubation. Because the light source is contained in the battery handle, they are cooler, reducing the risk of patient injury. The answer to both is a qualified yes! ADC blades and handles conform to ISO 7376 and ASTM F965. ADC blades and handles will be compatible with any manufacturer's brand that conforms to these standards. However, standard illumination components are not compatible with fiber optic components and visa-versa. The answer to this question depends on the application. EMS professionals seem to prefer Macintosh while Anesthesiologists tend to prefer Miller. No, but they are able to be sterilized. All laryngoscope blades and laryngoscope sets are supplied with complete instructions for use that outline the sterilization processes available. Refer to the specific product page that you are interested in, on our website, and download a free copy of the instructions for use which detail this information. Important note: The sterilization methods outlined in the accompanying instructions for use are the methods specifically validated for ADC products. Other methods may exist which will adequately sterilize the blades, but may reduce the lifespan of your devices. For specific sterilization questions or for questions, relating to the use of non-recommended products on ADC blades and handles, consult with the manufacturer of the sterilization equipment and supplies. The answer to this question depends upon the application. For basic reflex assessment, the Taylor hammer is the most popular. The pointed end of the handle can be used to elicit cutaneous reflexes, and the triangular rubber head is used for testing joint reflexes and bone fractures. The Wartenberg Pinwheel tests nerve reactions as it glides across the skin. It is designed for evaluation of cutaneous sensory and pain perception. The Babinski Hammer is designed for testing reflexes and is equipped with a pointed needle in the handle and a rubber head for reflex reaction. The Buck Hammer is used for cutaneous sensation evaluation, testing reflexes, and measuring nerve sensitivity. The Buck Hammer also has a needle in its head, and a brush in its handle. Tuning forks are used to conduct hearing and neurological vibratory tests. The C128 and C256 forks are generally used for the neurological tests, while hearing tests are often conducted using the higher frequency forks. As the frequency decreases, the tuning fork's arms must be increased in length. In order to keep the size of the instrument manageable, weights are added to the C128 and C256 frequencies. Without them, these two models would have to be considerably larger. The model for each tuning fork represents the vibrational frequency measured in cycles per second (cps) or Hertz. For example, the C128 vibrates at 128 Hertz or 128 cycles per second. ADC’s tuning forks are American made to the highest medical grade standards and accurate to within 5% of the rated frequency. The best way to activate the fork is by striking it firmly (but not with too much force) on a rigid surface. Snapping the tips of the fork prongs together with the fingers will also start them vibrating but probably at a lower volume. Striking the fork against the palm of the hand or any padded surface will dampen vibrations and is not recommended. Tuning forks of various frequencies can be used to test for pallesthesia as well as hearing disorders through the Weber and Rinne tests. This type of testing generally involves selecting a specific frequency of tuning fork (dependent upon the type of test being conducted) and activating it over bone or near the ear canal. ADC offers tuning forks in an assortment of frequencies to provide you with all of the tools you might need to conduct these types of tests. Testing for pallesthesia or vibratory sensation can be accomplished through the use of a tuning fork calibrated to a frequency of 128 Hz. Our model number 500128 will provide the appropriate frequency to allow for this type of testing anywhere on the body. The Weber test is generally conducted using a tuning fork with a frequency of 256 Hz. Our model number 500256 will provide the appropriate frequency for this type of test. Activate the tuning fork (as described further in this FAQ) and place the base of the tuning fork over thin skin that is in contact with bone, equidistant from both ears to perform the test. The Rinne test requires a tuning fork with a frequency of 256 Hz, and our model number 500256 is recommended for this type of test. As with the Weber test, the tuning fork is activated and in the case of the Rinne test the handle is placed behind each ear and then held next to the ear to allow the patient to determine how the sounds were transmitted during the test. To activate your tuning fork, hold it as close as possible to the end of the handle. For best results, strike the tuning fork gently against a hard surface near where the tines end. Note that you do not need to strike the tuning fork very hard against an object to activate it. Alternately, you can activate the forks by ‘snapping’ the tines of the forks. Place your thumb and index finger on the outside of each fork and then slide your fingers off the tip of each tine while moving them towards each other, as if you were snapping. This motion will set the tines to vibrating. Touching and holding the tines of the tuning fork while it is activated will cancel out the vibrations in the tines and silence your tuning fork.